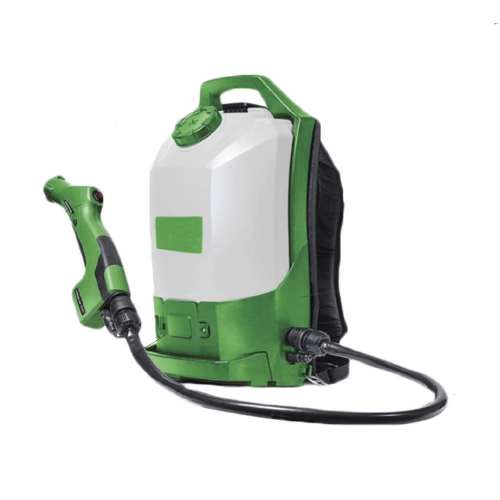 BACKPACK ELECTROSTATIC SPRAYER | Pro Chem, Inc.
Coverage per Tank*: 23,000 sq. ft. 20,600 sq. ft. 13,100 sq. ft.
To start the use of the victory cordless electrostatic backpack sprayer charge the battery for two hours before inserting the Victory 16.8 volt battery into the backpack. Plug the charger into a wall outlet until charging light registers on the charger base (Power Level) largest dot indicates fully charged smallest dot indicates low battery. When charger indicates battery is fully charged it can be removed from charger: Insert battery into backpack. To open battery door turn doorknob counter clockwise until the door opens (Reverse) steps to lock. Align battery grooves then push battery forward to a locking position (listen for the click). To close door tighten knob clockwise until it can’t be turned anymore. IMPORTANT: Door must be closed at all times when the backpack sprayer is being used, failure to close the battery door would cause failure to the battery if the battery gets wet. Recommended before filling tank: IMPORTANT: Unlatch tank lock from backpack by lifting upward and outward from backpack base. Fill tank with solution before inserting tank back into backpack housing. Remove the battery from the unit. Insert the wrench with nozzle into the front end of the unit. click the nozzle is in position. Remove the wrench when complete. Insert the nozzle wrench into the front of the unit. Rotate wrench until the tabs on the nozzle line up with the slots in the wrench. When the tabs and slots are lined up the wrench will be completely inserted into the front end. To remove, rotate the wrench in the counter clockwise direction until the nozzle comes loose (1/4 rotation). Turn the tool counterclockwise to lock the nozzle in place with a click feeling. Take out the tool and you will find the nozzle is already at top position. You can select anyone of the three nozzles by turning the nozzle clockwise by means of the assembly tool. This machine contains an electrostatic device that may interfere with sensitive medical devices such as pacemakers, defibrillators or similar devices. DO NOT operate this machine or stand within 10 feet if you use such medical devices. Contact your physician prior to operation if you are unsure if this machine will interfere with your medical device.